The late Nob Yoshigahara was responsible for bringing to us many of the Cast Series' greatest puzzles. On one of his journeys to find unique puzzles, he met with Professor Bakalar from Prague, Czech Republic and was introduced to the Cage puzzle. He later made a few tweaks to the design and released it as a Hanayama Cast Puzzle in 1996. The Cast Cage is a very interesting puzzle. This concept has been used in many different versions and, as a matter of fact, I already own in my collection a rather similar replica in size and shape. This was even before I had knowledge of the Cast Series variety. I acquired this version in a job lot, together with other puzzles, so I'm not sure of its origins. It doesn't have "Cage" engraved on it, neither "Hanayama" at the bottom, so it's definitely a replica. The texture is also quite different, as the surface is very smooth compared to the rough texture of the original. You can see the differences in the photo below (original on the left and replica on the right). The object of the Cage is simple enough to understand at first glance: There's a golden six-point star inside the cage and you need to free it by passing it through one of its four openings. Although with a different design, I also found the Cage to bear a slight resemblance to the Cast Star, where you have to free a similar six-point star, except it's trapped on a snake-like loop. 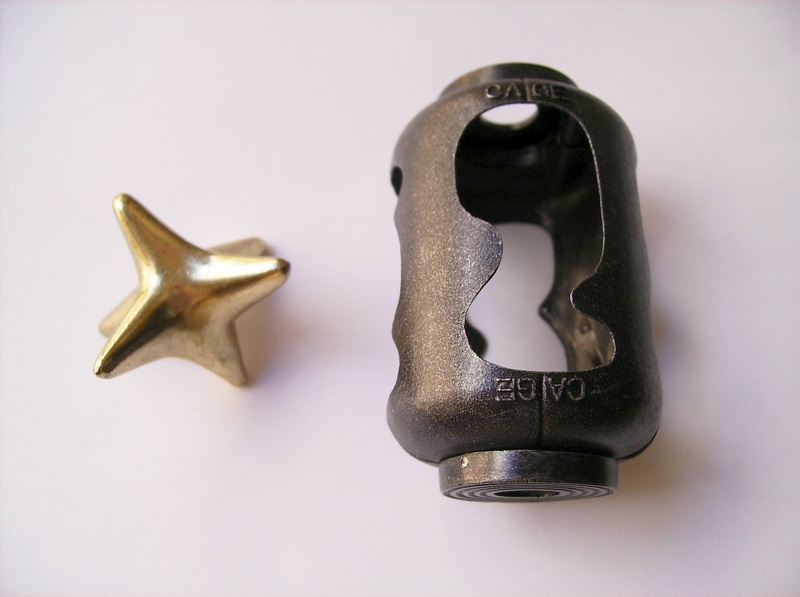 The Cast Cage is a Hanayama level 3/6, so difficulty-wise you won't find much resistance. I found that it's a little difficult to maneuver the star inside the cage, because of its small size, and if by any chance you have big fingers, you really have to struggle a bit to get the star out. The openings on the cage are all different, so at first, you might find a little challenging to find the correct one. If you carefully observe the openings though, it's easy to see which one would be large enough to let the star go through. After I've got the star out, I tried the other three openings as well, but with no luck, so it's possible that it has indeed only one way to be solved. The Cast Cage is a very well thought concept. It's responsible for a multitude of other similar versions that use a cage-like appearance and various other objects to be freed. Personally, I reckon the design of the cage should've been a little bigger, as sometimes it's difficult to get a grip on the star. Other than that, I strongly recommend it to anyone with a slight interest in puzzles. Availability: You can get a copy of the Cast Cage from the Finnish puzzle store Sloyd, as well as all the others in the series. The 24 Triangles (a.k.a Bermuda Cube) is yet another difficult puzzle, designed by Wim Zwaan, from my latest Brilliant Puzzles order. It's a brilliant puzzle that has more to offer than it meets the eye. The puzzle is made from eight small cubes, each with three triangles in adjacent faces, which in turn have different orientations. In total, there are 24 triangles - hence the name of the puzzle - and your task is to build a larger cube so that all triangles fit together. Note that two triangles will form an inner square and no triangles shall be viewed from outside. Made from two contrasting wood types, light for the cubes and dark for the triangles, the puzzle is reminiscent of a wrapped gift box. 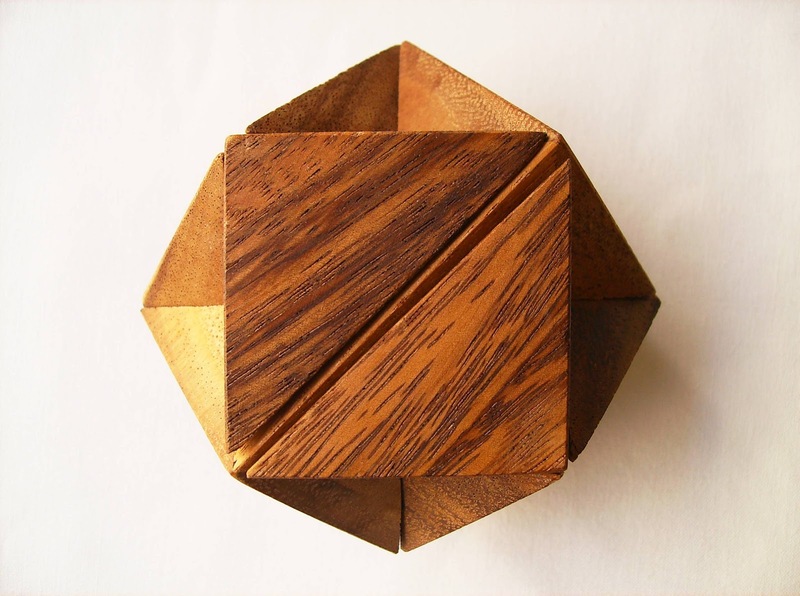 It comes with a truncated wooden stand, for a more stylish presentation and measures 7 x 7cm (about 2.8"). To solve the puzzle, I would recommend that you do it outside the stand, because that way you'll have more visibility all around the cube. Keep it for displaying purposes only. This is a level 4/5 puzzle, as rated by Brilliant Puzzles, and I totally agree. It may even be a 5/5 if you're not used to this type of assembling puzzles. First of all, you should know that if you get this puzzle, it might not be exactly as the one shown here. This is because there's two versions of the puzzle, each with different triangle configurations, thus making two completely different solutions. According to the provided solution sheet, I seem to have the version 1 of the puzzle. In terms of difficulty, they are pretty much the same, since the only thing different about them is how the triangles match. Challenge-wise, this is a hell of a puzzle. It took me almost an hour to finally reassemble the cube. 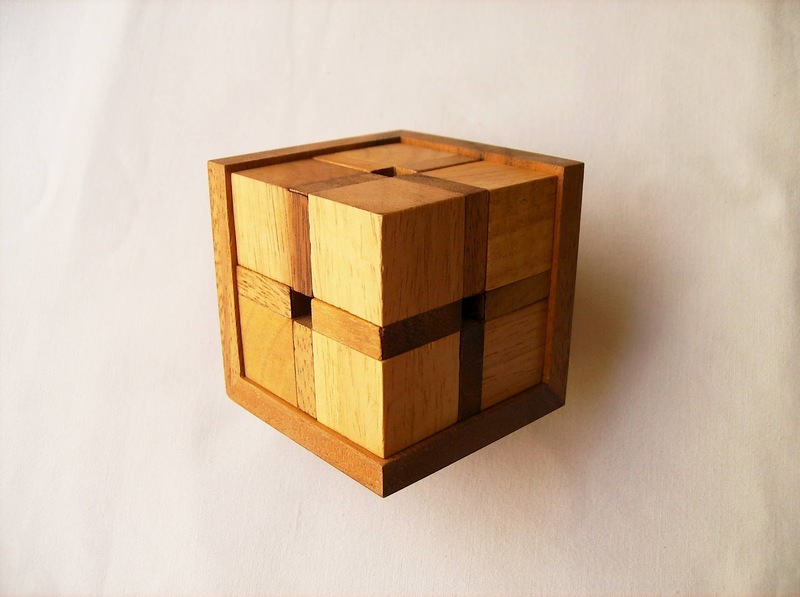 If you decide to tackle the puzzle with a trial and error strategy, it might take you some time: You can start by building the first layer and then, one by one, add the remaining cubes. If you don't succeed at first, don't take apart the first layer. Try different combinations for the last four cubes until all possibilities are done. If by then, you're still out of luck, try to rebuild the first layer with different cubes. Another strategy, though, much more methodical, is to analyse the first two cubes that are linked together and see if you can find another two cubes that'll fit right on top of them. Finding these opposite matches proves to be more efficient and time saving than simple trial and error. Overall, the 24 Triangles is a great puzzle. It has, essentially, what makes a good puzzle: a nice concept and elegant design, and most importantly, an engaging challenge. Definitely worth a try. 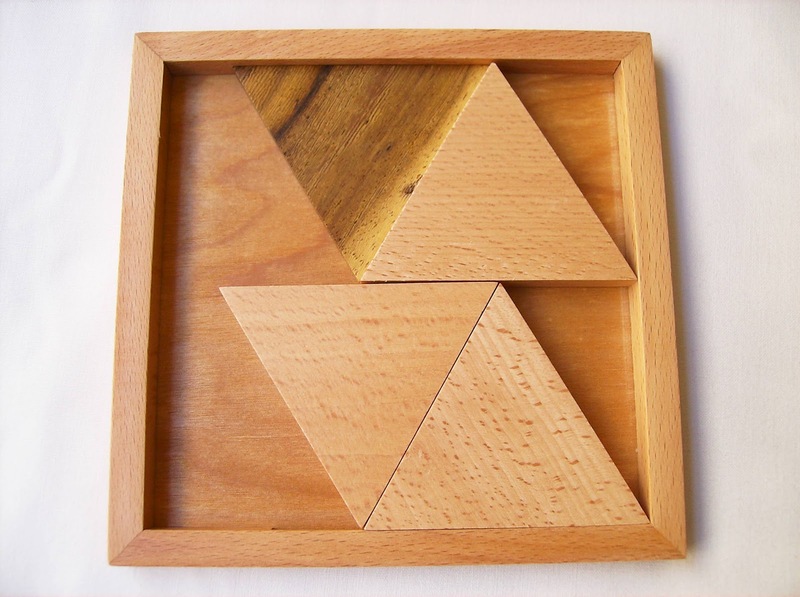 Availability: The 24 Triangles is available at Brilliant Puzzles for about $13 USD. 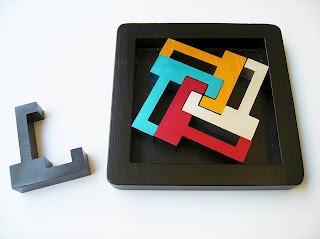 A couple of weeks ago, I reviewed a different kind of puzzle that is intended to be more like a decorative object or a collector's item than a challenge in itself. 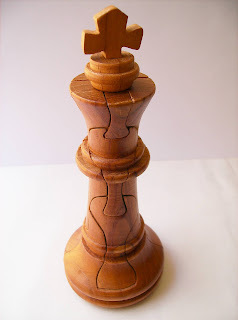 I'm talking about the Chess 3D Jigsaw, and today I will review the King, which will keep my Queen puzzle company in my collection. 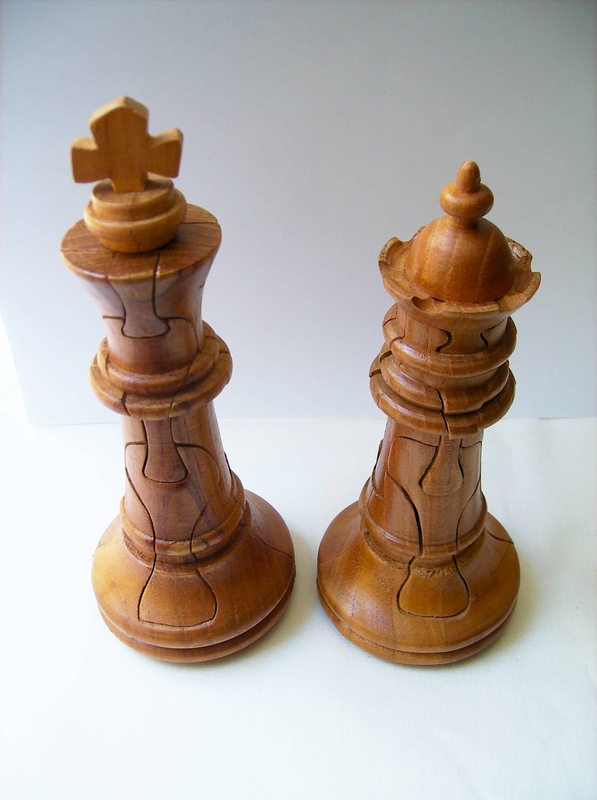 These two puzzle are very similar in design, and even though the king is comprised of 9 pieces (the queen has 7), they both share the same difficulty, which is close to unchallenging. The king is also a bit taller than the queen, measuring about 19.5cm in height (7.6"). This type of puzzle is very simple: The pieces are linked together sort of like a classic jigsaw puzzle, and the goal is to take them apart and reassemble it. 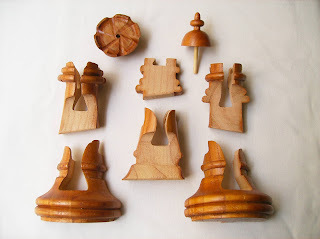 As mentioned in the previous review, these puzzles are part of a series of six chess pieces, manufactured by Bits and Pieces and made from Chinese Rosewood. I've already said quite a lot about Bits and Pieces quality standards, so you won't read nothing new. The build quality of the puzzle is subpar, to say the least, and despite being a little better than the queen, there's still plenty of room for improvement. I know the puzzles are handcrafted, but unless they were made by an apprentice, there's no excuse for the sloppiness in the cuts and lack of polish. 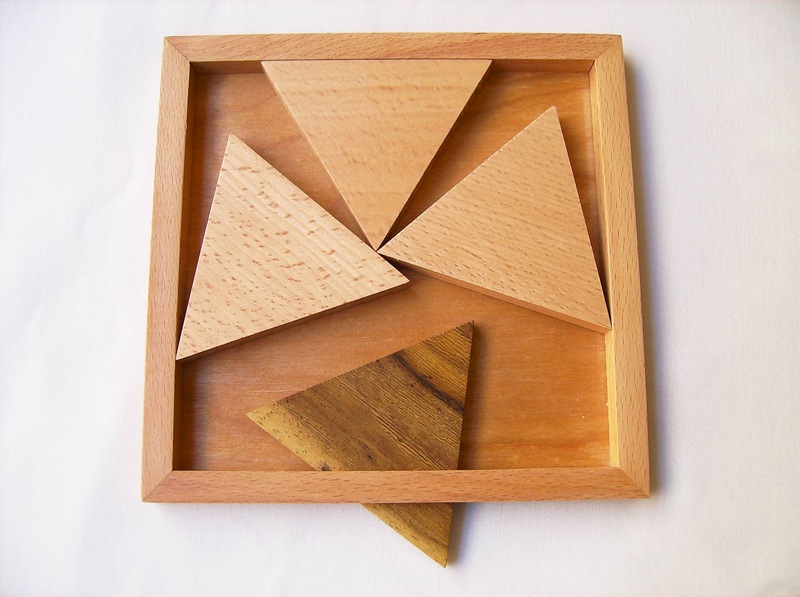 Just take any of the Vinco's puzzles and you'll see what a great handcrafted puzzle should look like. PuzzleMaster rates the Chess King as a level 7/10, but as I've mentioned above, there's not much of a challenge here - This is a mere 5/10 puzzle. I actually have solved harder 5/10 puzzles in the past. The puzzle is designed in such a way that you'll be taking it apart from top to bottom and reassembling it the opposite way. When getting the puzzle back to its original form, the only thing that seems to be a little harder is figuring out which end do the pieces slide into place, as there's just one possible way to do this. Being an easy puzzle, it doesn't mean you can't have fun with it, though. The concept is interesting enough to give it a try, and although it'll keep you busy for just a couple of minutes, at least you'll have a very original decorative desk object in the end. If you're a puzzle collector, I'm sure you're gonna love to own the full set of chess pieces. Availability: The "Chess 3D Jigsaw - King" came from PuzzleMaster and it's available from $13 CAD. Click here to check out the others in the set. 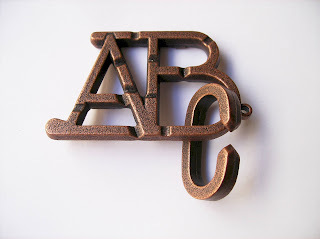 Continuing my reviews of classic puzzles revived by Hanayama, this week I bring you the Cast ABC. One of the very first Cast puzzles released by Hanayama, back in 1983, along with the Cast Star and the Cast Key, the ABC is a new version of the 1911 classic puzzle from England. The key word for the ABC is "tracks". 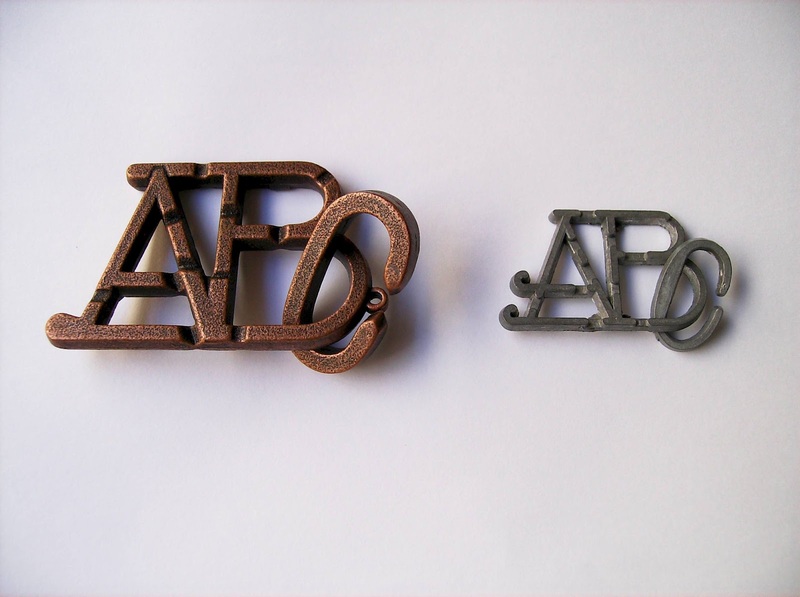 Design-wise, the ABC is practically identical to its classic counterpart, expect for its overall appearance and dimensions, which is about double the size. You can also make a keychain out of it. I took a comparison photo with an older version that I already had in my collection (don't know if it's the actual original version, but it looks old), and as you can see, it's much smaller (photo below). It also looks like it's made from aluminum, judging by its color and light weight. The Hanayama version, on the other hand, appears to be made of brass, with that characteristic awful smell of metal. I reckon they could have added a coating finish to it, but my guess is that they wanted it to look as more authentic as they could, which is why it has this rough surface and old-looking appearance. The object of the puzzle is very simple: just separate the C piece from the AB. The concept is very similar to the Cast Bike, another classic, in which you also have a small piece that has to travel across a path full of indentations in order to be freed. 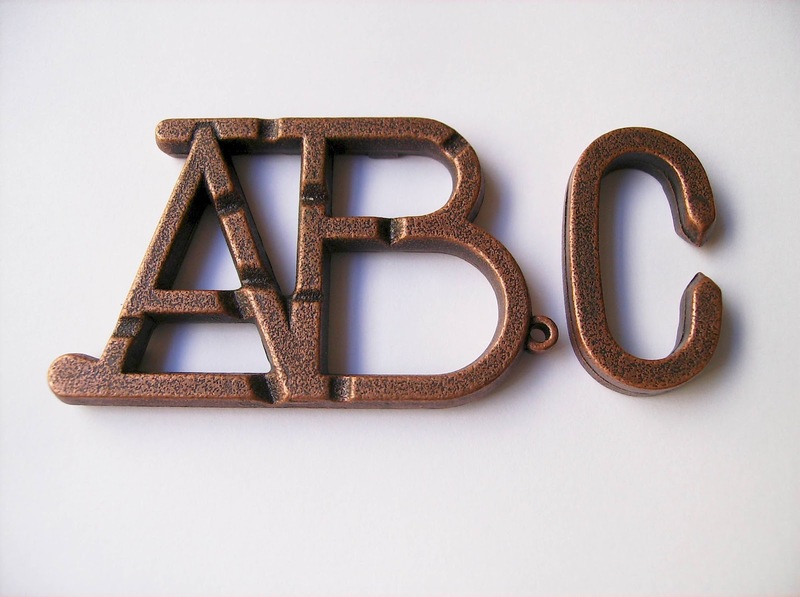 The ABC is exactly the same thing, as you try to free the C piece by going through the same type of indentations. The ABC is one of the easiest in the Cast Series and it's great for someone unfamiliar with this type of puzzles. It's rated as a level 1/6 and as expected, you won't feel much challenged by it. However, I do think that it's a very fun puzzle to fiddle with, just like the Cast Bike is - One of my favorites, actually. As you travel across the paths, or "tracks", as hinted by the late Nob Yoshigahara, you'll find some dead-ends along the way. Sometimes you might need to flip over the C in order to get it to pass through another indentation, but overall, that's about as hard as it can get. There have been quite a few other versions of the ABC puzzle throughout the years, but from what I've seen, Hanayama's version is unrivaled with its superior quality. My only complaint is the choice of brass, because it leaves an unpleasant smell on your hands afterwards. If you want a tough challenge, you have to look elsewhere. The Cast ABC is basically for beginners and collectors. If you liked this one, I recommend you to try the Cast Bike as well. Availability: The Cast ABC is available at Sloyd, from Finland, for about €10. If you're interested in getting others from the Cast Series, check out the store's special Hanayama section. Coordinate-motion puzzles are fascinating in that they always have a tricky way to be disassembled. You have to find out which parts must be pulled and on top of that, you'll have to do it simultaneously. The Hexagon Cube is a nice design that cleverly uses the coordinate-motion technique. The designer is unknown to me, but if I had to guess, I'd say it could be a work done by Vinco - No offense to the designer, if it happens to be another craftsman. Edit: I have just learned that the design is in fact by Stewart Coffin and it's called Seven Woods (made from seven different woods). It's Coffin's #42 from his numbering system. It's a shame that the version I have is only made from one wood type, otherwise it would have been even prettier. I guess for $10, you can't ask for much, now can you? 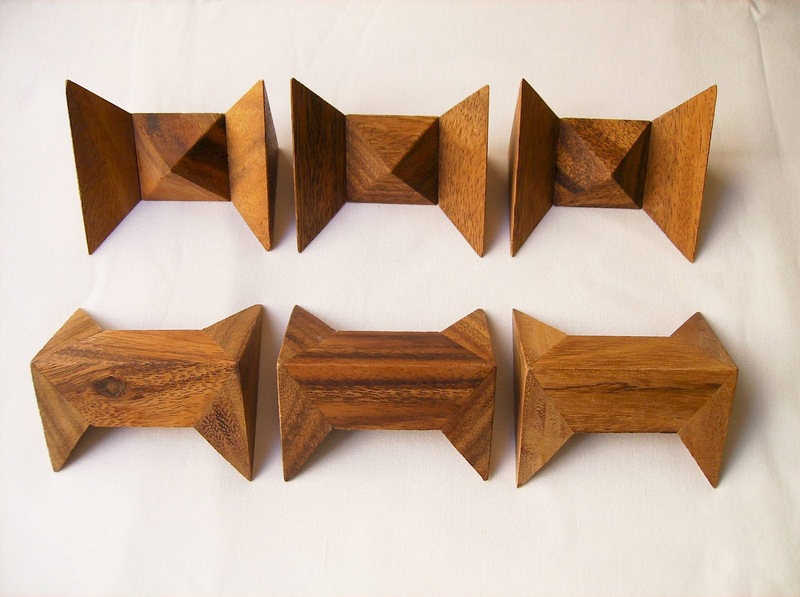 The Hexagon Cube is comprised by six identical pieces (in the shape of a bow tie) made from a darker tone wood, and it measures approximately 7.5cm (about 3"). It's called Hexagon Cube because it has six cubic faces that when viewed at a certain angle, it shows a hexagon shape (Top photo). The overall shape of the puzzle is quite interesting, actually: Depending on the angle you're seeing it, you'll notice different shapes. Most coordinate-motion puzzles have one thing in common: their pieces are usually identical and when they're not, they share some kind of symmetry or they're mirrored from one another. This is because when you're separating the pieces they'll slide off in opposite directions, which is difficult or impossible to achieve when you have completely different pieces. The puzzle is rated as a level 3/5 by Brilliant Puzzles and even though the coordinate-motion can be a little tricky, it's not the harder one I've seen. For one, the pieces are somewhat loose and you can see where they intercept with each other. Moreover, the movement required to separate the pieces is not very difficult to discover, either. After you have disassembled the puzzle, getting it back together may be a little more complicated, but nothing overly complex. You just need to get five of the six pieces in place, but with plenty of room. Don't get them too tight. Next, try to place the sixth piece so that all pieces are at the same distance from the center and push them in simultaneously. They should slide back to place pretty easily. 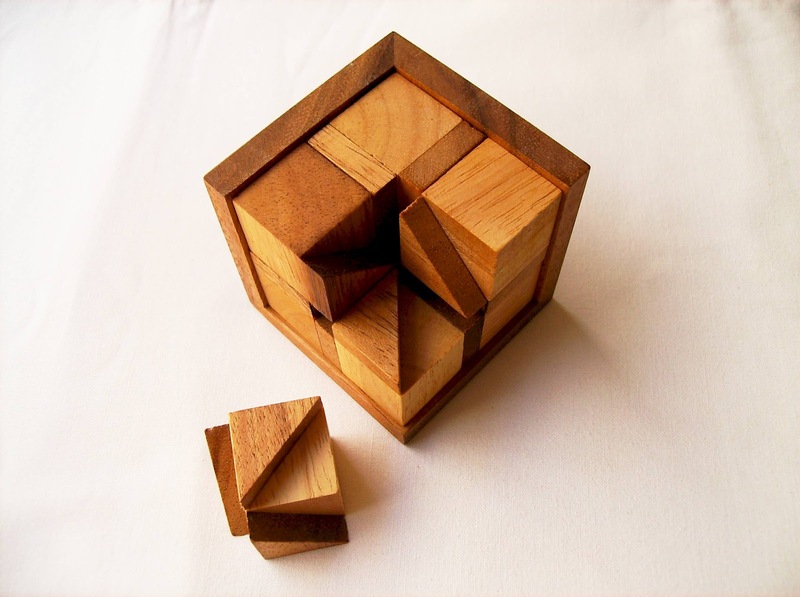 Interlocking puzzles have a way of arouse our curiosity, at least puzzle people. We like to uncover their secret and to know how they work. The Hexagon Cube, although not very challenging, still succeeds in capturing your attention for a brief moment. What I liked most about it was its design and shape. I strongly recommend it if you're into interlocking and coordinate-motion puzzles. 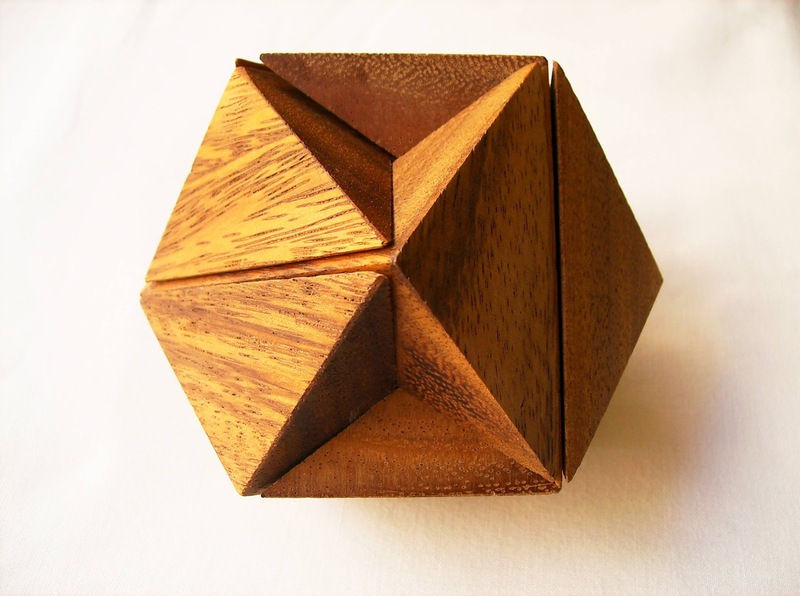 Availability: I got the Hexagon Cube from the American puzzle store, Brilliant Puzzles. 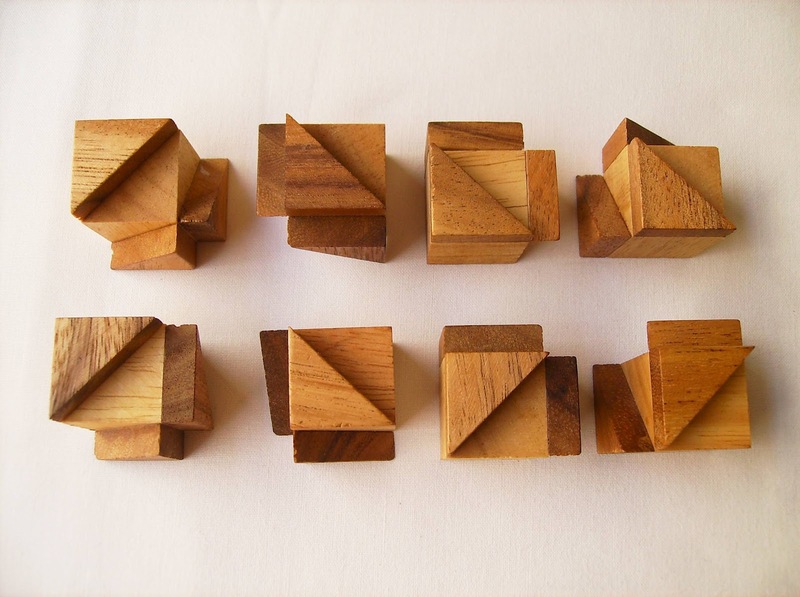 Philos, a German puzzle manufacturer, has a very interesting series of original wooden sliding puzzles designed by the Japanese Hirokazu Iwasawa, the Jam Puzzles. I chose to review the easier of the four, the Triangular Jam Puzzle. What I like about Philos' puzzles is that they're very high quality. The tray and the pieces are very well built and polished for a clean and smooth surface. 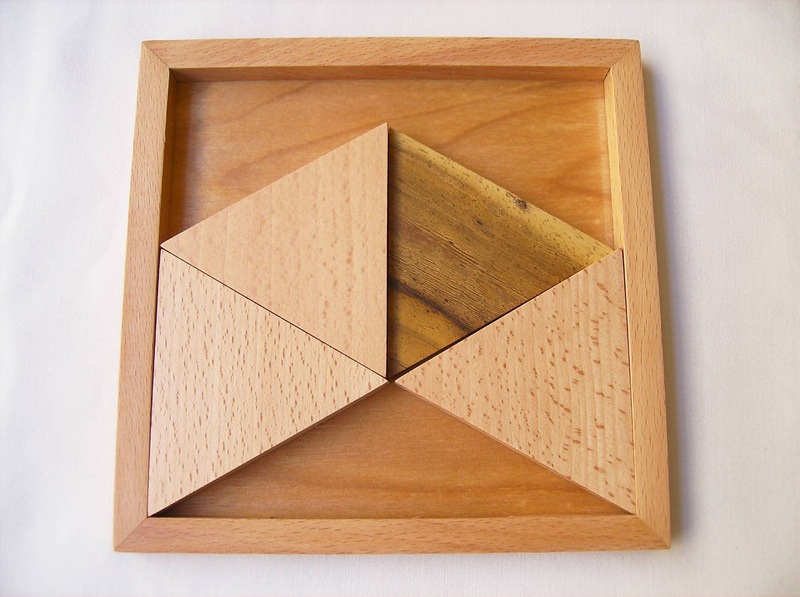 This particular one is made from Beech wood, tray and the three lighter pieces, and the darker triangle is made from Cassia Siamea wood. The dimensions of the tray are about 15cm square (5.8"), so it's very easy to handle the pieces. 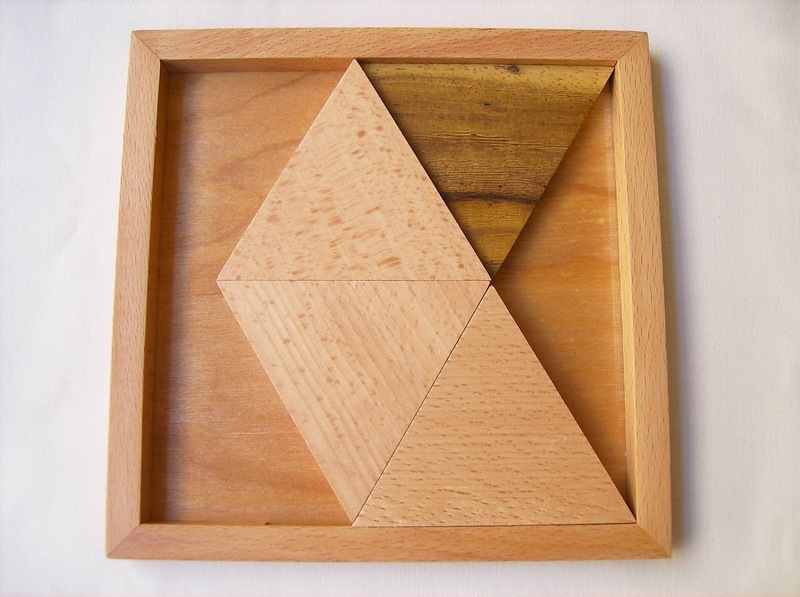 The goal of the puzzle is very simple: you have four triangles inside the tray, three light and one dark (the dark one is also thinner), and the object is to only slide the pieces in order to free the darker triangle, through an opening at the bottom edge of the tray - No piece is to be raised or resting on another one. You are given a standard starting position to solve, but you can try other arrangements as well. As I said above, this is the easier of the four Jam Puzzles, rated as a level 7/10 by PuzzleMaster. There's one rated as a 8/10 and two as a 9/10. At first, when you start to move the triangles, they jam quite easily against each other (hence the name "Jam") and you'll struggle a bit to find a way through. 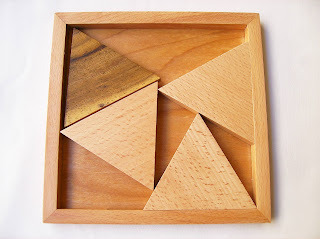 Here, the quality of the puzzle really shows: because they are very well polished, their edges allow them to slide very easily, so most of the time, you just have to keep rotating them around the tray - in the case of the standard challenge, counter-clockwise - until you can slide your dark triangle through the slot. When I say you have to rotate the triangles around, it's not as easy as it sounds. It has more to it than a simple move. The trick here is to always try and make room for the next triangle to slide over. Note that the tray is not large enough to have two triangles with their bases side-by-side. After a few minutes of fiddling around with the pieces, the dark triangle was finally free. When you solve this challenge, however, the fun doesn't have to be over. You can try other challenges as well with different starting positions. Below, you can see in the photos a couple of examples. I have tested them and they're all solvable. The Jam Puzzle - Triangular was a really nice puzzle to play with. It's not particularly challenging, but still fun and enjoyable. Trying other challenges with different starting positions is a great way to keep playing with it. Now, after solving this one, I look forward to try the harder versions. Really worth a try. Availability: You can get a copy of the Jam Puzzle - Triangular at PuzzleMaster for about $19 CAD. For your reference, you can also take a look at the Triangular Jams: the Hexangular; the Pentangular and the Rectangular. I wonder why they called it just Horse and not Horseshoe. After all, the puzzle is comprised by three horseshoes. If I didn't already know what the puzzle looks like, I'd say that it probably had something to do with a horse figure. I reckon "Horseshoe" would be a more appropriate title, but as we've come to expect from Hanayama, they like to keep the names as simple as possible. Anyway, who am I to question their decisions? - They've built a successful company over the years, so whatever they wanna call their puzzles, it's fine by me, because I'll certainly enjoy any puzzle they produce. 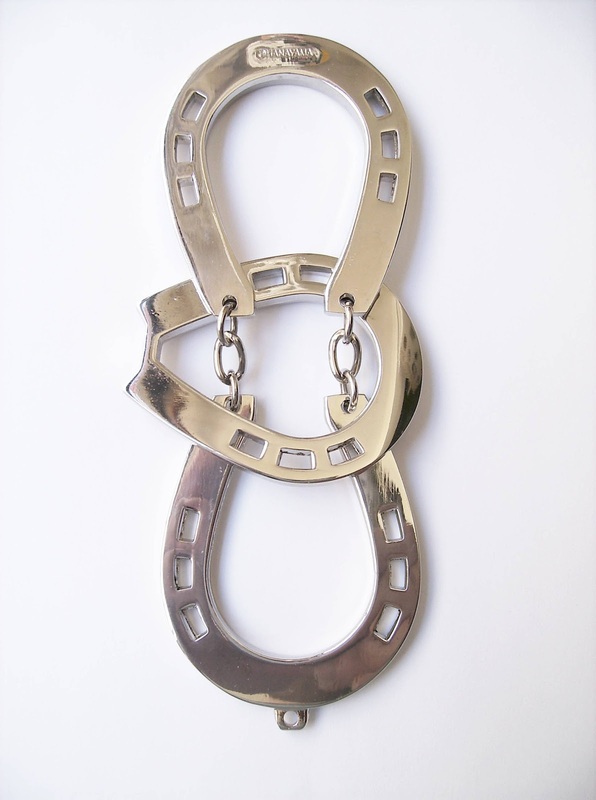 As mentioned above, the Cast Horse has three horseshoes, two are linked together and a third one, with a closed loop, is entangled at the center. The object is to discover how to remove the closed horseshoe without breaking the links, of course. Hanayama did a wonderful job with the design. It managed to revive the puzzle and still kept it simple. I have an old design in my collection with the same exact concept, except it's made from wire. As you can see, the difference is staggering. 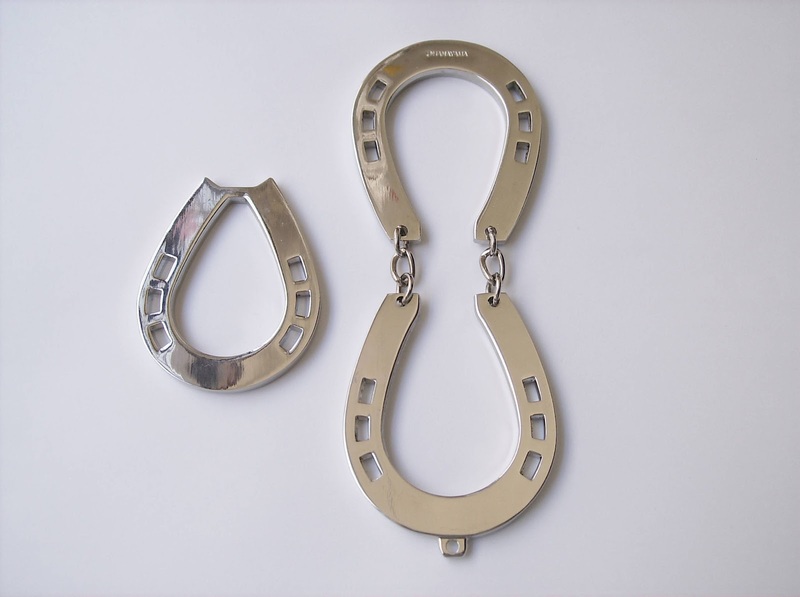 The puzzle closely resembles real horseshoes, and although the scale is smaller, the shape is perfectly made. On top of that, the coating does wonders at making the surface of the puzzle extremely smooth and reflective. If it were for me, I would change the color of the central horseshoe to a golden tint, like they do in some puzzles, to emphasize contrast. Nevertheless, It's a great looking puzzle. In terms of difficulty, the Horse is not considered to be a hard puzzle. In a scale of 1 to 6, it's a 2. 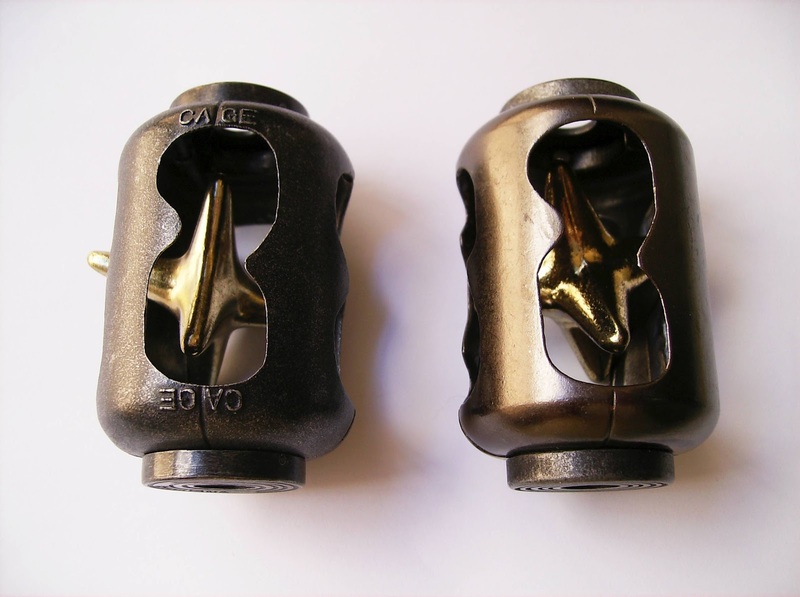 However, like many of Hanayama's ratings, the level of difficulty is far from being consensual. 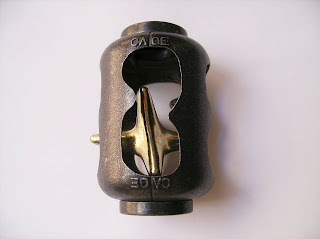 I remember trying to solve that old Horseshoe puzzle years ago, and had trouble understanding how would it be possible to remove the central part. I know I'm not the beginner at solving puzzles, like I was a few years ago, but I reckon that while the movement performed to solve the puzzle is quite simple, it's not so simple to someone not used to this type of puzzles. And even if you remove the central horseshoe, you still need to understand what you did in order to put it back again... And here, in my opinion, lies the true challenge - Getting it back to its original position. Since I knew how to solve the Horseshoe puzzle prior to getting Hanayama's version, I didn't have trouble solving this one. If you're trying it for the first time, it might take you some time to figure it out. If removing the horseshoe is a level 2, then putting it back might as well be a level 4. I gave the puzzle to a few family members to try and solve it, and even after I explained the trick, they still had trouble to grasp the exact movement. This is to show that the puzzle is not as simple as Hanayama makes it seem. Solution: To download a solution, check out the puzzle's page at Sloyd's. As I said, Hanayama is a master at reviving old designs. The Cast Horse is a brilliant concept and is sure to intrigue anyone curious about mechanical puzzles. Above all, don't underestimate it, as it can prove to be one tough nut to crack. Availability: You can get a copy of the Cast Horse at Sloyd.fi for about €10, as well as all the others in the Cast Series. Oftentimes, as a puzzle collector, I like to deviate a little from the classic mechanical puzzle and see what else is out there that deserves a place in my collection. 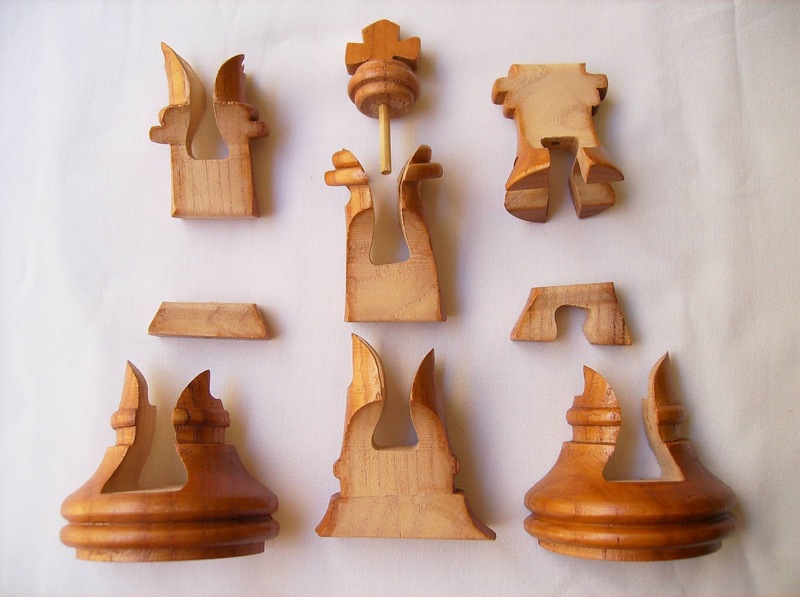 Recently, I discovered these 3D jigsaw puzzles that depicted chess pieces and was fascinated by them. 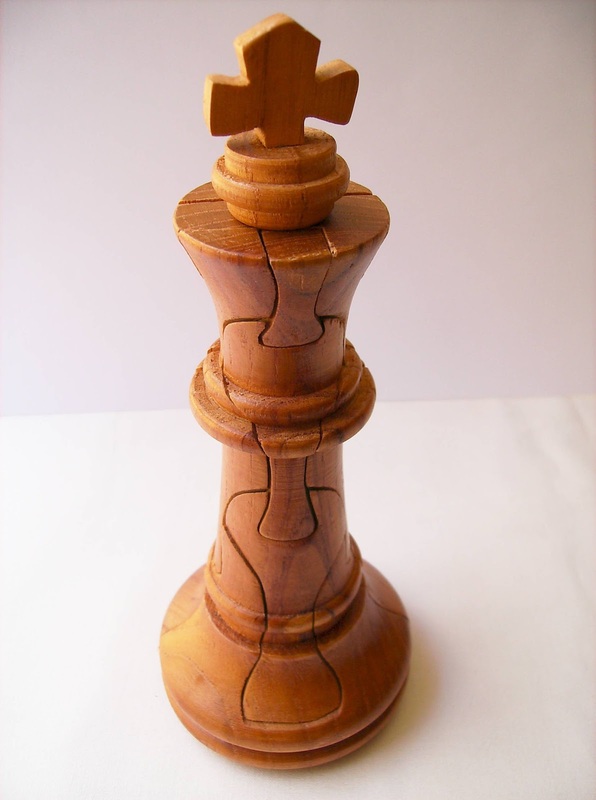 You can get any of the six pieces standard pieces, from the King to the Pawn. The one that I'm reviewing today is the Queen. The puzzles are handcrafted from Chinese Rosewood and can range from 7 to 11 different pieces - The Queen is made from 7 pieces. I was pleasantly surprised by the actual size of the puzzle, which is bigger than I was expecting. At the Brilliant Puzzles website, from where I got the puzzle, it states that it measures 7.75"H x 2.75"D. Since I don't pay much attention to the dimensions of the puzzles when I'm looking at them, and on top of that, Inches are not Europe's measuring unit, no wonder I was surprised by its size. By the way, for your reference, the puzzle measures about 18 x 7.5cm. The Chess 3D Jigsaw puzzles are produced by Bits and Pieces, so in terms of overall quality, it leaves much to be desired. The pieces could have used a bit more polishing around the edges and a coating of glaze would have made a world of difference. I understand this is an affordable product, but cheap is not synonym of low quality craftsmanship. Difficulty-wise, the Queen piece is rated as a 3/5 level of difficulty, but as far as I'm concerned, it's no more than a 2/5 at best. Taking the pieces apart is rather easy: You have to start at the top and remove the pieces one by one by sliding them from one side to another. For a first timer, it might take a minute or so to discover how to disassemble it, but once you take off the first piece, the others offer no challenge. Assembling it back is even easier. The only thing you have to take into consideration is that the pieces will only slide into slot from one of the sides, so you may have to try it from both sides. Side Note: In order to take it apart, you need to remove the pieces from top to bottom. Reassembling it is the exact opposite: you have to start from the bottom and work your way up. The wood grain in the pieces can give you a direct hint as to how they match. The "Chess 3D Jigsaw - Queen" is not what I would recommend to an experienced puzzler, but I don't think it was built to be extremely challenging. 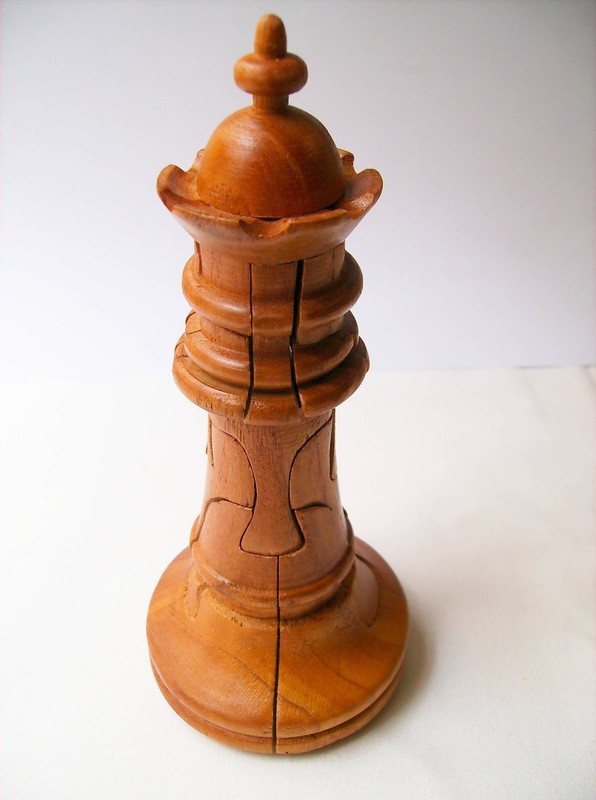 It's a great collection item and decorative object, and makes for a perfect gift to a chess aficionado. My only gripe with this puzzle is the lack of quality to the finishes. Nevertheless, it's a nice puzzle and I look forward to get another chess piece. Availability: You can get the Queen Chess piece at Brilliant Puzzles, as well as the other five in the collection - Just search for "chess" at the main page. I ended last week with a review for a Jean Claude Constantin's puzzle, and what better way to start a new week of reviews than with another one of his designs? - Hercules is a clever little puzzle that will put your packing skills up to the test. It was an exchange puzzle at the 22nd IPP in 2002. Also known as the 22nd Labour of Hercules (direct relation to the 22nd IPP) or 5 L Dose Neu, the puzzle comes with 5 identical L-shaped pieces and the object is to get them all inside the tray. Solving the puzzle might not be a Herculean task, but it can still be quite tricky. Mostly known by his wooden puzzles, Constantin produces his own version in different woods, which look very nice. The version of the puzzle that I have, though, is manufactured by Bits and Pieces, in aluminum and coated with different colors. The tray is made of wood painted in black and measures 11.8 x 11.8cm (4.6"). I should've known better by now not to trust anything coming from Bits and Pieces, but since I was getting more puzzles from PuzzleMaster, I thought this one looked very interesting, and despite previous bad experiences, I decided to take a chance. Turns out, I'm yet to get one good clean puzzle from them. I wasn't very surprised when I first look at the overall look and presentation of the puzzle and saw many imperfections in the coating finish - There are cut marks and spots everywhere, which in no way hinders your puzzling experience, but for a collector, like me, I can't help but wonder why they don't make a greater effort in making a flawless-looking puzzle. I'm not asking too much, am I? 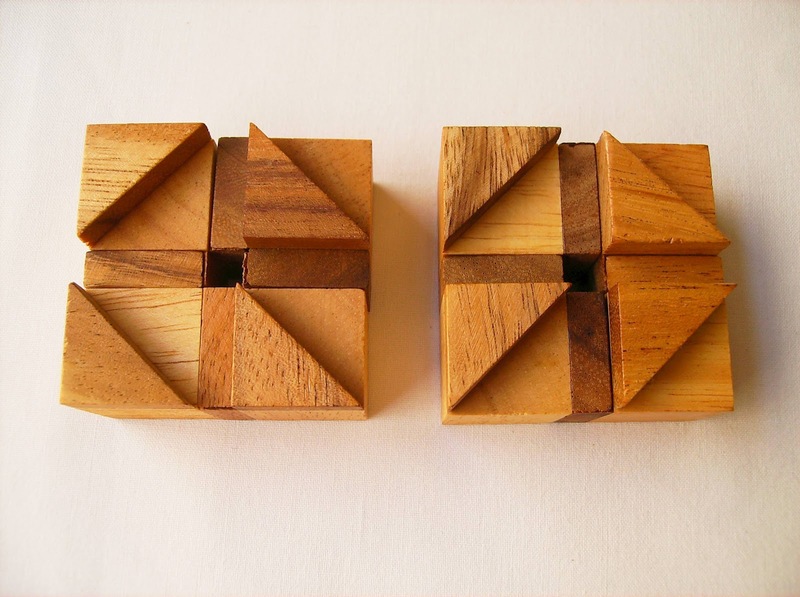 The L-shaped pieces are in fact comprised of two C-shaped parts joined at a 90º angle. 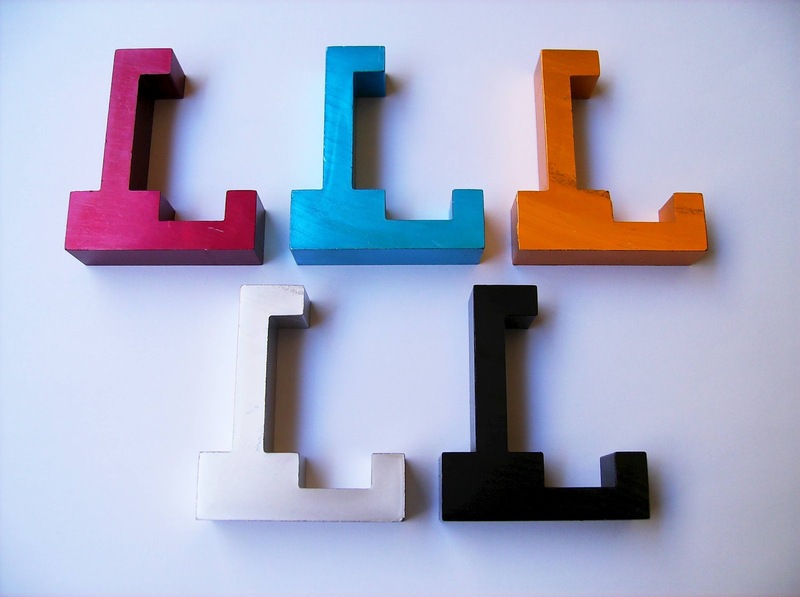 This is easier to notice in the wooden version, as C pieces were actually used and glued together to make the L pieces. The bottom part of the L has an indentation the same size as the top, which is sort of a hint as how the pieces should be packed. Solving-wise, the Hercules is a level 7/10 difficulty, and unless you're an absolute beginner, it takes no more than a few minutes to find the solution. The puzzle is described as having only one way to fit the pieces into the tray, but the solution I found is actually different from the one provided, and in my opinion, more elegant. So, there's at least, one more solution for the puzzle. Solution: Check out the provided solution and mine. Jean Claude Constantin should prohibit Bits and Pieces from producing any of his puzzles. If I was a puzzle designer, I wouldn't be very flattered to have my designs butchered like this. I made the mistake of ordering another Bits and Pieces puzzle, by Serhiy Grabarchuk, with my latest PuzzleMaster order, and guess what? - It's even in worse condition than this one. Unless you really like the puzzle for its actual concept and as long as you don't mind imperfections (imperfection being an understatement), I can't recommend any puzzle from this company, at least made from metal. As for the puzzle itself, and being a packing puzzle fan, all I can say is that the Hercules is a really good challenge. It's simple enough for anyone to try it without being too frustrating, and still be satisfying. Availability: You get a copy of the Hercules puzzle at PuzzleMaster for $17 CAD.